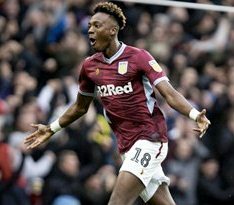 Tammy Abraham is involved in the race for the EFL Championship top scorer award after scoring his 20th goal of the season as Aston Villa recovered from three goals down to draw with Sheffield United on Friday. Heading into the fixture at Villa Park, the England U21 star of Nigerian descent was level on 19 goals with Sheffield United veteran marksman Billy Sharp. At the end of the contest, the Chelsea loanee is now two goals behind Sharp who scored a hat-trick against Aston Villa. In the extraordinary game, the visitors were cruising to a 3-0 lead before Tyrone Mings pulled a goal back in the 82nd minute, then Abraham fired home at the back post after goalkeeper Henderson parried a shot into his path in the 86th minute. Although the Aston Villa striker will enjoy the finest season of his career to date if he scores seven more goals, beating the 26 goals he scored while on loan at Bristol City during the 2016-17 season, he has set a target of 30 goals this term. Abraham is the leading scorer of Nigerian descent in England's top four divisions ahead of Josh Maja (ex-Sunderland), Plymouth's Freddie Ladapo and MK Dons' Chuks Aneke.